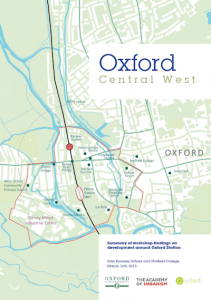 Several key sites including the large area around Oxford Station and Oxpens; land on both sides of the railway; the area between Hythe Bridge Street and Park End Street, and the Osney Mead industrial estate are likely to be redeveloped over the next ten years. This offers a unique chance to create a new gateway to our historic city, a first class transport interchange, space for a range of employment and much needed housing. In the past major developments have tended to be carried out piecemeal, each with a Master Plan which often failed to consider what would be happening in neighbouring areas. Oxford Civic Society realised this was a great opportunity to bring together a wide range of interested parties and encourage them to look for ways of co-ordinating their plans and create an outstanding new area of the city. Together with the Academy of Urbanism, Oxford Civic Society organised a well-attended workshop on 16 March 2016. Represenatives of most of the main stakeholders – Oxford City and Oxfordshire County, Oxford University, Nuffield College, local residents’ associations, major developers and environmental groups came together to see if they could find a way forward which would deliver a successful and enduring future for this central part of the city. The workshop demonstrated that the old Parish of St Thomas offers space to enlarge the city centre to service a greater Oxford. If it is developed imaginatively it can help provide affordable housing, generate better jobs, solve transport problems, help reduce pollution and improve the quality of life for all. This will not be achieved without many years of effort.